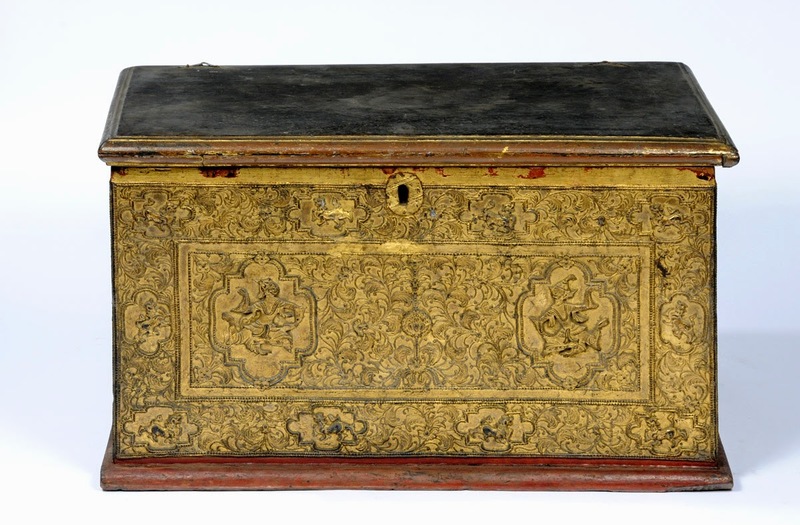 Caption: A gold and red lacquered wooden chest made in Myanmar (Burma), 1860-1885, which will feature in the 'Voices of Asia' exhibition. Picture credit: Courtesy of Leeds Museums and Galleries. A stunning new gallery showcasing Asian culture in all its wonder and colour will be unveiled at a popular Leeds museum this week. In what will be the first major gallery refresh at the museum since its opening in 2008, the fantastic sounds, diversity and culture of Asia will be revealed as part of the ‘Voices of Asia’ Exhibition, which will open its doors to the public on Friday April 18 2014 at Leeds City Museum. Sitting on the first floor of the museum in the World View Gallery, visitors will have the chance to enjoy and take an unforgettable journey through seven major themes. These include; Faiths & Festivals; Trade & War; Fashion & Style; Music, Dance, Theatre & Film; Eating Out & Eating In and Faith in Focus. Featuring in all of the themes will be a variety of interesting and diverse objects and pieces taken from the Leeds Museum and Galleries collections and also a wide range of loans from the Asian community, partners and city universities. The displays will include a friendly Chinese New Year tiger puppet, a model of the Golden Temple at Amritsar, a huge Chinese temple gong and two painted marble statues, of the Hindu deities Krishna and Radha, purchased from Leeds Hindu Temple. Hello Kitty makes an appearance and some old fashioned rag dolls from Gujarat. As part of the first Faith in Focus, the many facets of Hinduism will also be showcased and celebrated. Researched and developed by the Leeds Museum and Galleries team, who have worked closely with a wide range of local community groups and organisations including South Asian Arts UK, Leeds Hindu Mandir, Hamara, Jamyang Buddhist Centre, Leeds Asian Blind Association and Shantona at Leeds Museum and Galleries, ‘Voices of Asia’ replaces the acclaimed ‘Out of Africa’ gallery which displayed the city’s African collections. Also available to view at the museum are a host of other fantastic attractions. These include a new permanent display of the Harrison Clock, which played an important contribution in efforts to accurately determining longitude at sea, and the skeleton of a large, now extinct, flightless Moa bird originally hailing from New Zealand, which recently completed a journey from the Leeds Discovery Centre to its new home. Over 100 spectacular wildlife images taken by keen photographers from Leeds of all ages are also available to view until 17 August as part of the Natural Beauty exhibition. "We are very excited to be opening the new ‘Voices of Asia’ display at Leeds City Museum this week, which incorporating seven different themes, promises to be a really fantastic place for all the family to visit and enjoy. "Our Leeds Museum and Galleries team has worked closely with the local Asian community to capture the unique and sights and sounds of their culture and traditions, and we hope the authenticity of the display will really shine through for visitors." "As Curator of World Cultures the idea for Voices of Asia has been with me for ages, ever since we opened the World View gallery and I suggested we have Africa up for five years and then switch to Asia. "Leeds has great Asian collections and as I’ve been working as curator since 1997, I have grown to know and love them well. In 2008 we did the big Chinese Treasures project with Leeds Chinese community, and since then we have also worked with many other British Asian communities across the city, especially the joint work I’ve done with the Community History Team. "I enjoy most the opportunity to work with and learn from the members of these different communities, and also the handling, photography and research work that curators focus on. Last year I also had a grant from the British Council for a study trip to India, and was able to visit museums in five cities, attend the amazing camel fair at Pushkar, walk around the ancient town of Jaisalmer where Leeds’ large merchant door comes from, and learn loads about Indian textiles, crafts and faiths."